The American Eskimo Dog is a smart, affectionate pet that loves to be around its family. They are playful and energetic without being too rambunctious. These dogs are small enough to live in apartments, so long as they get ample exercise. This being said, they are not best for owners who will not be home for most of the day, as they are prone to separation anxiety and will bark as a result. This breed is also known to chew as well as bark when they are left to their own devices. The American Eskimo Dog is highly trainable, however, and with proper training, these bad habits can often be ironed out. Daily exercise is also important in preventing bad behavior, as they will become antsy and anxious when cooped up in the house all day. Something as simple as a walk around the neighborhood is enough to prevent them from chewing on one of your shoes or antagonizing anybody who walks by. These dogs are known to be very sensitive to the way they are treated. Their treatment is often directly reflected in their behavior as well. The best way to have a good, playful Eskie is by being kind and playful with them. When it comes to temperature, they’re more lenient. These dogs handle cold weather very well and tend to fare okay in the heat as well. This being said, they should not be exposed to any weather extreme for extended periods of time. The American Eskimo Dog is a great, fun pet for families with children of any age. Due to their size and reserved, yet playful behavior, these dogs play well with kids. They are less likely to injure smaller children, as they are simply not large enough to knock most children down. This being said children should always be monitored and taught the proper way to handle these dogs when playing. On top of being warm towards children, these dogs are also reasonably hospitable when it comes to new people. They are naturally suspicious towards strangers. However, a well-socialized Eskie will warm up quickly to any guests welcomed into the home. These dogs are known to be playful with most of anyone that they meet. All people who are new to the home should also be taught the proper way to handle the Eskie at hand. As well as being able to happily coexist with children, Eskies are also known to live well with other canines. They are suspicious towards unknown dogs. However, those welcomed into the home can easily be brought into the American Eskimo Dog’s circle of trust. An Eskie that is raised with other canines is even more likely to be hospitable towards other dogs. Having another dog for them to play with is a great way to keep them occupied, especially if they are home alone. The American Eskimo Dog is known to give into their urges to chase the odd squirrel around the yard, and out of it. This being said, it’s important to have some sort of enclosure for these dogs, as they will start to explore if given the opportunity. A simple electric fence would be enough to keep these dogs on the property, as their size makes them less likely to plow through a shock to chase a car. Having an invisible fence also allows for an Eskie to explore his property without surveillance, helping them to get their essential exercise. This breed is known to be fairly vocal about anything they find out of the ordinary or curious. They will bark at most passersby, reiterating the need for early socialization in training. Despite their natural suspicion and alerting, Eskies will rarely have any bite behind their bark. They are not known to be aggressive towards strangers. Instead, you only have to worry about them antagonizing your neighbors with their excessive barking. Most Eskies will be more relaxed if they are not living in areas with a high population density of humans or various wildlife. 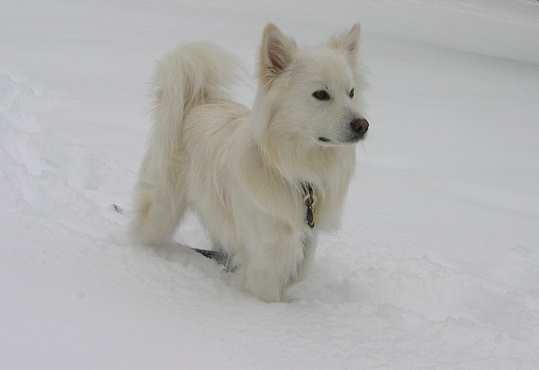 The American Eskimo Dog is one of the many breeds that fall under the Spitz type. These Spitzes originated in Northern Europe, as suggested by their thick coat, designed to keep them warm in unusually cold climates. Known to be dogs of Nordic descent, Spitzes have spread all around the world today, making up a lot of dog breeds. With fossils resembling the modern Spitzes dating back to about 2,000 years ago, it’s likely that they were the base for many modern breeds. The American Eskimo Dog was once the Deutch Spitz, as it lived as a working dog in much of Germany. On farms, these dogs were used to help herd, haul, and keep watch. Their skills in herding and being alert watchdogs proved especially useful for these German farmers, as whole villages would base their communities off of farming. These dogs spread into Europe, maintaining their German name until the eruption of the World Wars. After World War 1, the Deutch Spitz saw its name changed. This was a direct result from the generally negative connotations that Germany had during this time. 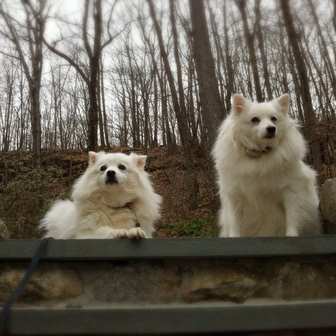 To prevent the breed from being persecuted for its German roots, the Spitzes that had made it to America with German immigrants were renamed the American Spitz, later the American Eskimo Spitz. Meanwhile, in its home continent of Europe, it was just referred to as the Spitz in most countries. In Europe and in the US, these Eskies were used as performers, sometimes in circuses or while traveling with gypsies. Being famous for their intelligence and trainability, these dogs wooed almost anyone they came across. However, during the Great Depression and World War 2, many of these dogs became too expensive to own as pets. Many breeds saw their populations fall, which led to the more common white Eskies to be singled out due to their popularity in the US. After the war, these dogs saw their popularity surge. Due to the economic boom felt by the US at this time, citizens were allowed to enjoy a higher quality of life. This led to a huge boost in popularity when it came to most domestic pets, especially dogs. The American Eskimo Dog was soon living more as a companion rather than a performer. Despite the breed having existed in the US since the 19th century, they were not standardized and registered with the AKC for a long while. It wasn’t until 1985 that the National American Eskimo Dog Association was created to organize the showings of these dogs. The breed continued to grow its population throughout the world among its fellow Spitz breeds. Today, the American Eskimo Dog holds the ranking as the 123rd most popular dog breed registered by the AKC, after their registration in 1994. The American Eskimo Dog is not known for presenting too much difficulty in the training process. These dogs are intelligent and have a high aptitude for learning. They are famous for their participation in obedience events due to their capabilities in executing tricks and commands. Their enthusiasm towards learning is only gained if their owner approaches it correctly, however. Consistent positive reinforcement for good behavior is always more effective than scolding for bad habits. These dogs, like many, are always easier to train when they are not competing for a position as head of the household. An American Eskimo Dog needs a confident owner who presents an air of superiority, or else they will try and assume the role as pack leader. Their independent personalities make this task a bit more difficult, however, if presented with an unwavering trainer, they are more likely to cooperate. Socialization is an important part of training any dog. 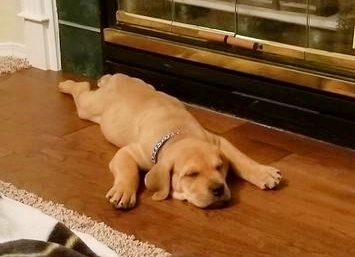 Socializing from an early age will help dogs be more comfortable and calm as adults. Most owners will accomplish this by introducing their dog to a variety of people and pets, as well as taking them for frequent walks. Not only will this exercise the dog, but it will help them become accustomed to their environment and the presence of strangers. This is especially essential with this breed due to their vocal personality, as it will make them less noisy and nervous in response to something they find unusual. As you can imagine, a dog the size of the American Eskimo Dog will not fare too well when it comes to protecting you or your family from physical harm. Their physical build is simply not enough to stop an intruder, despite them most likely making a valiant attempt in doing so. On top of them being incapable of protecting their owner, they do not present an air of intimidation either. These small dogs are not likely to deter anyone from entering the property as well. Despite their inability to defend against an intruder, these dogs are accomplished at alerting their owners to one’s presence. These dogs are known for being fairly vocal about things they find unusual. They are known for being wary pets, and would be able to sense the presence of a stranger just walking past their home. If not guard dogs, they are capable of keeping watch. These dogs are only suited for giving a warning as well. Their personalities are typically warm towards strangers, as they have a friendly demeanor towards most people. 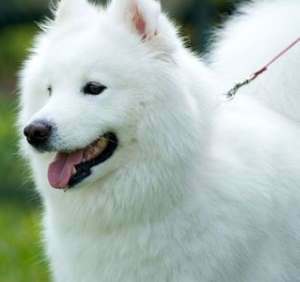 An American Eskimo Dog should not be put in a position where they are to be an extra defensive measure, they simply don’t have that attitude towards people, as they are not very territorial dogs. The American Eskimo Dog is famous for its dense, yet fluffy white coat. They shed year round, with heavier shedding when the seasons change from cold to hot weather, and vice versa. Most owners recommend brushing them at least 2-3 times a week to prevent matting and remove shed hair and dirt. These dogs tend to stay relatively clean and odorless, so many owners will only bathe them every couple months, or as needed, as over bathing can be harmful to their skin. It is just as important to brush a dog’s teeth as their coat. Maintaining a dog’s dental health is as essential as a regular vet visit. Regular brushing will help prevent tartar and bacteria buildup, as well as keep the dog’s breath smelling fresh. Most owners will brush their dog’s teeth at least 2-3 times a week. 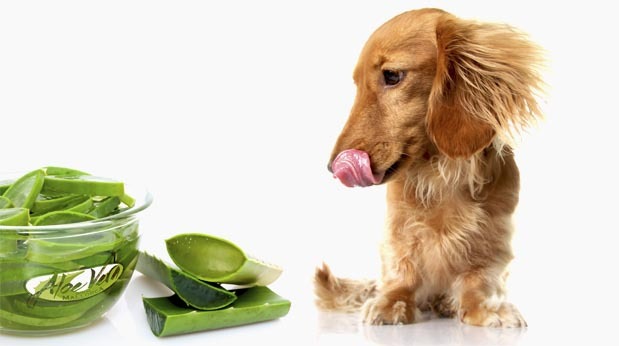 Maintaining a dog’s nails is another essential part of keeping them comfortable and healthy. If a dog’s nails get to be too long, they may become uncomfortable and even painful. Most owners will clip their dog’s nails at least every 3 weeks. A good way to tell when a dog’s nails have gotten to be too long is by listening to them clicking against the ground as they move. Bacteria can live inside a dog’s ears as well as their mouth. It is important to regularly check and clean a dog’s ears to prevent infection and the buildup of wax. Most owners will check and clean their dog’s ears at least once a week. 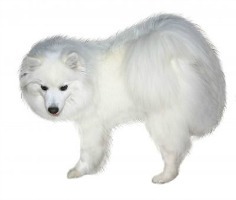 While the shape of the American Eskimo Dog’s ears allows for more airflow, the need for cleaning is still high. Unfortunately, there is no such thing as universal health care for dogs. As an owner, you must be capable of providing the adequate medical care for your dog. This goes beyond the regular vet visit, and you must be prepared for any possible bumps in the road. The American Eskimo Dog is known for being a relatively healthy, long living dog. This being said, they are still susceptible to health problems. As with many purebred breeds, these dogs are more prone to certain health conditions than others. Despite the American Eskimo Dog not being a very popular breed, it is still important for you to purchase one from a reputable breeder. A good breeder will know their breed inside and out, being able to answer any of the questions you may have for them. They should also be capable of passing health checks for their dogs.